Langtang Region is a popular for walking. It is located in the north central part near the Kathmandu valley. Langtang region treks go through the sub-tropical rhododendron and oak forests and you encounter with the numerous ethnic Tamang villages. Langtang village, Kyanjin, Gosaikunda and Helambu valley are some of the renowned places in the Langtang circuit route. Hikers can find 1-2 week itinerary to explore this region. Loaded with both the natural and cultural diversity, Langtang region is dominated by the evergreen forest of the Langtang National Park, terraced landscape, Langtang Lirung and other Himalayan sceneries. 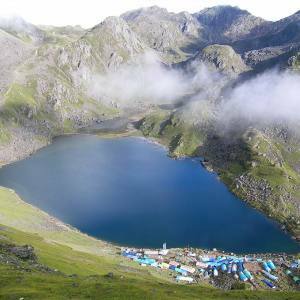 Gosaikunda Lake and its surrounding, thrilling Lauribina Pass and the striking Helambu valley are its attractions. Tibetan Buddhism is another beautiful aspect of why to trek in the Langtang region. Nepal Kameleon Holidays leads you closer to the wonderful cultural side of the local communities. Tamang people have a vibrant ethnic culture and lifestyles. Ancient Gompas, Chhortens and Mani walls are prevailing. Langtang valley trek, Langtang Gosaikunda Trek, Helambu Valley Trek and Langtang Circuit Trek are some of the popular hiking packages in the Langtang region.